Traditionally integrating with systems that don’t offer APIs or a shared storage mechanism (such as open tables) has been something of a headache often resulting in the ‘last mile’ of the integration process being manual. The manual steps often come because the cost of building and maintaining the means to integrate has not been cost effective or even an option (vendor has end of lifted a product, and not willing to add an integration mechanism). Oracle have been working in partnership with one of the leading RPA product vendors – UiPath, which has resulted in an adaptor for Oracle Integration Cloud. The adaptor allows you to pass data to the UiPath Orchestrator component which will run the processes in an unattended mode. In the adaptor configuration you provide information about how many resources you want the Orchestrator to apply to the task, the queuing of the job and so on. Whilst Oracle’s roadmap in the RPA space is not entirely clear we have heard indications that Oracle are limiting themselves to just UiPath (this is what UiPath say about the partnership). Regardless of the approach you’ll see that the adoption of RPA is important in Oracle’s vision, with their Agile Finance making a clear indication of its view (see the paper here). When ICS was launched it delivered on of the values of PaaS namely you didn’t need to worry about setting up storage, database and compute, it was all sorted out for you. Admittedly it come with a lack of elasticity when it came to resilience and scaling. In contrast Services such as SOA CS which required you to go through each of the layers, but gave you a degree of flexibility. The whilst simpler than building SOA on-premises it still represents a laborious and fiddly process that took time. When OIC (Oracle Integration Cloud) arrived and the introduction Universal Credits we had a pricing model that made it a lot easier to be elastic in terms of approach to resourcing, but a deployment model that following SOA CS rather than ICS. To an extend, one step forward, and another back. Fortunately we are seeing head way that means we have recovered that backward step. Earlier in 2017 the Oracle A-Team released a Python library that abstracts the ICS REST API to make some management tasks that you may wish to perform easier. For example identifying a set of integrations and activating or deactivating them, or simply importing and exporting them. In this Definitive Tip we will look at the REPL tool and its benefits. The REPL tool can be downloaded here. ICS pricing is based on two aspects – the number of connections and the number of messages processed. But what constitutes a connection? What happens if I exceed the number of messages or connections? Enriching an integration from data in a database or DBaaS (Database as a Service) is not an unusual requirement. Many integration use cases today need to access a database that is on-premises. The means to connect to the database is fairly obvious – the connection agent. Our book goes into a lot more detail as to why that is, and the implications of using database connections. However when it comes to Oracle’s DBaaS a service it would be very easy to assume that given that you’re using two different parts of Oracle’s PaaS that it would be straight forward to connect the two together without an agent. However, at least today whether its on-premises or DBaaS you need to use a connection agent. This does mean that you’ll need an IaaS node to host the connection agent. This quirk is driven by the fact that there are some scenarios that this does actually make sense. For example – the Oracle domains need to have a high level of isolation, so when the DBaaS is in another domain then the decoupling via the agent makes sense. When your database is in a different zone of the cloud – then you’re running DB calls across what is effectively a wide are network – not good. The question of conditional mapping comes up regularly on the ICS part of community.oracle.com which prompted us to write this blog. So if you want the output of an integration in element X to contain value from element A or B depending upon element C there are a number of answers, each having pros and cons. So let’s look at them before we offer an example of how we would solve the simpler more common problem.. Your choices are …. Single path through the integration Simpler to read and see visually Can be used either in the condition oer the mapping. Easier to apply than XSLT directly. In our book we talked about the difference between the agents offered by ICS, namely the Connection and Execution agents. Whilst we differentiated the two, we did focus on the connection agent as this is the type we expect to see used in most cases. However the execution agent still suffers from a level of confusion, and it has been helped by being called ‘ICS on-premises’. As part of a number of recent conversations the questions and confusion of what the execution agent is and how it works has come up. There is the well known saying ‘a picture is as good as a 1000 words’ which prompted us to develop the diagram below as a power point slide – in its power point form much of the detail is used as an animated build up. In ICS Definitive Guide #2 we looked at the scheduling of integrations and mentioned the possibility of using iCal. In this tip we shall explore advanced iCal facility for defining schedules within ICS. The iCal format is probably best known for sharing meeting events in tools such as outlook. The format is actually a standard defined by the IETF originally in 1998 (https://www.ietf.org/rfc/rfc2445.txt) and updated several times the latest being 2015 (https://tools.ietf.org/html/rfc7529). The goal of the definition has been for the purpose of driving standardisation across PIM tools (Personal Information Management) tools which includes Outlook and Thunderbird etc. It is a substantial standard the original document ran to 150 pages, but the section supported by the schweduler’s advanced option purely relates to the reoccurence definition covered by section 4.3.10 of the original RFC, and only takes five pages. If you want to know lots about iCal and the varying revisions then you may find https://icalendar.org/ helpful. It is worth mentioning that today ICS under the hood exploits Oracle’s Enterprise Scheduler Service (ESS). ESS documentation identifies that it works to the 2445 version of the specification (see here). ESS became a 1st class citizen component with the start of the 12c middleware product stack. As a result, if you see any errors processing an iCal configuration the error codes will reference ESS does. In this Definitive Tip, we are going to look at the ability to use Versioning on Integrations to seamlessly deploy update integrations is an important requirement of any enterprise integration platform. ICS supports the model of semantic versioning, perhaps better recognised as versioning as Major, Minor and patch. Which is best described at http://semver.org/. This post will demo a minor and then a major version change. So we can see how change as the behaviours change between the two. A major change indicates an likely change in definition and minor one reflects logical change. To demonstrate versioning we need an integration that is currently active. Ideally, you will have some sort of data feed or test framework, such as SoapUI or even a simple cURL script regularly triggering the integration. We need this script running to demonstrate the impact of the cutover. 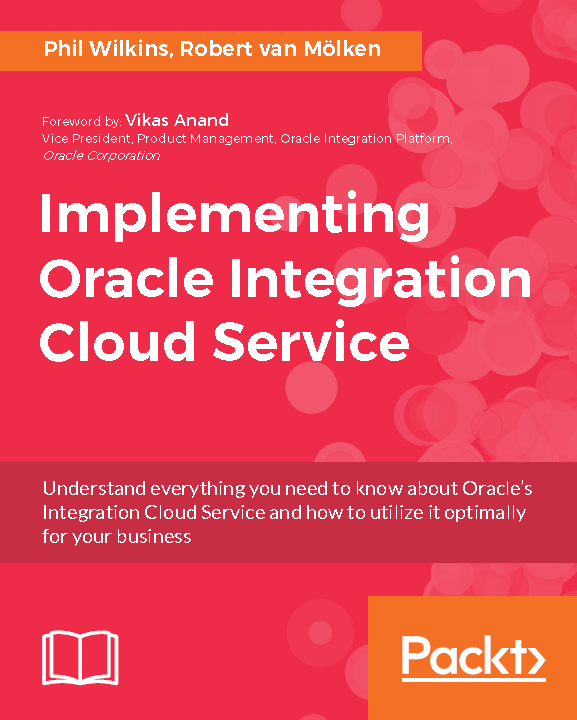 The website is dedicated to the book Implementing Oracle Integration Cloud Service written by Robert van Mölken and Phil Wilkins. On this site you find supporting resources for the book as blog posts extending the book scenarios and useful resources for ICS.